Two Part-Arr! This is the eleventh comic in “Damania Requisitioned” – a new webcomic mini series featuring the characters from my long-running occasional “Damania” webcomic series. Links to many more comics featuring these characters can be found in the “2016” and “2017” segments of this page (there are also two in the “2015” segment, but they aren’t canonical). As usual, this comic update is released under a Creative Commons BY-NC-ND licence. Well, it’s the end of the month and that means that it’s time for me to collect the usual list of links to my ten favourite articles about making art, making webcomics etc… that I’ve posted here over the past month (with a few honourable mentions too). Although there were far more reviews than usual this month, I quite like how at least a few of the “proper” articles turned out. Drinkin’ dens! 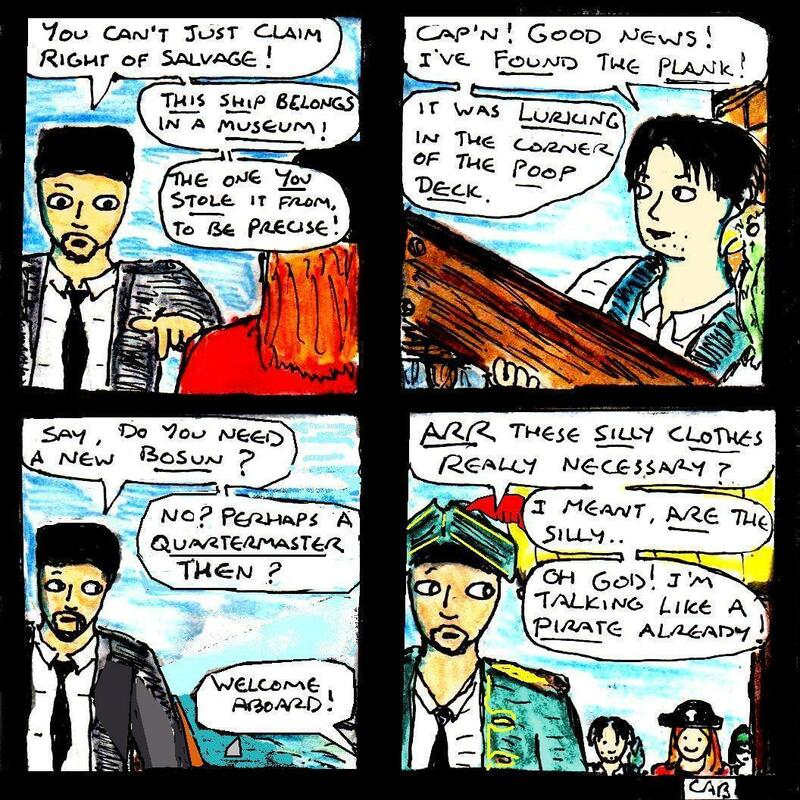 This is the tenth comic in “Damania Requisitioned” – a new webcomic mini series featuring the characters from my long-running occasional “Damania” webcomic series. Links to many more comics featuring these characters can be found in the “2016” and “2017” segments of this page (there are also two in the “2015” segment, but they aren’t canonical). Fun fact: This comic is actually kind of two comics squashed into one. I’d originally miscounted the number of updates I’d planned, so I had to cut one. 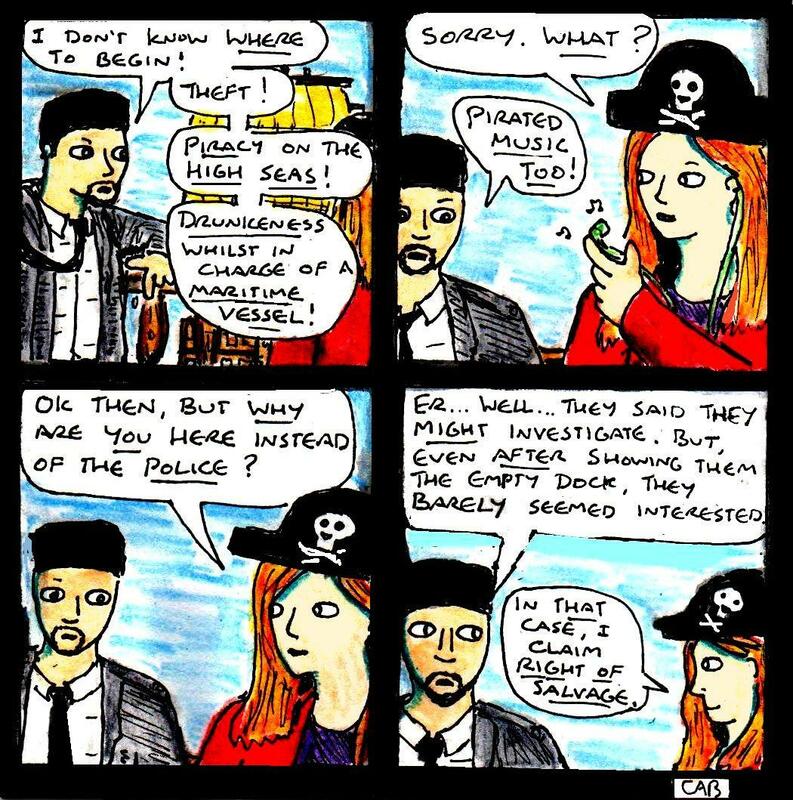 The first of the two bar-based updates would have covered the events of the first panel, the second would have involved Harvey talking to a grizzled old pirate (and was a partial repeat of this comic). But, then I thought of a better idea for the rest of the comic. Although I probably won’t write a full review of it, I’ve been watching a really interesting TV mini series on DVD called “Spartacus: Gods Of The Arena”. Anyway, it contained a very interesting linguistic gimmick in the dialogue which I thought that I’d discuss here. Even though this show has the classic “it’s ancient Rome, and most of the characters have British accents” thing, the writers have made the main characters speak in a very clipped and grammatically-different way (often leaving out the word “the”), presumably in order to mimic Latin grammar. I don’t speak Latin, but the few Latin phrases I know all use a different type of grammar to English. It’s a very imaginative linguistic experiment, although it often doesn’t really work that well in practice. Sometimes, it sounds authentically “Roman”, sometimes it sounds like broken English and, other times, it just makes the characters sound melodramatically abrupt. Even so, I can see why they tried to do it. When it comes to writing dialogue in comics, fiction etc… there has to be a balance between realism and making the dialogue understandable to the audience. After all, people in Ancient Rome spoke Latin with Italian accents, rather than English with modern British accents (historical British accents sound very different). But, the show was produced primarily for American audiences (even though it was also released on DVD here in the UK) so it makes sense that the characters would be speaking English instead. So, I can see why the writers compromised and tried to include some Latin-style grammar in order to hint at the fact that the characters would have been speaking Latin. Getting the language right in unusual settings is often a bit of a complicated thing, although I’d often argue that you should lean heavily towards understandability, even if it comes at the expense of realism. Plus, as I mentioned in this other article, there are a lot of subtle things that you can do in order to make the dialogue fit in better with the setting. Although my other article talks more about how language evolves in fictional settings, there are obviously several ways that you can make the language used in historical settings sound more authentic, without making it seem incomprehensible. The classic trick is, of course, to use lots of posh-sounding words like “aye”, “verily” and “forsooth” (and I sort of did this in at least one historical comedy/sci-fi comic), but the opposite to this can often work considerably better. For example, like with HBO’s “Rome” TV series, one thing that “Spartacus: Gods Of The Arena” nails perfectly is the grittiness of the language used. Thanks to Shakespeare, past film censorship and other such things, there’s often a false impression that people in the distant past were a lot more sophisticated and polite than people are these days. So, the liberal use of four-letter words in these TV shows is probably a lot closer to how people used to speak in Ancient Rome. A time where people had fewer puritanical hang-ups about the human body, sexuality etc… A time where, instead of peacefully playing violent videogames, people entertained themselves by watching gladiators literally fight to the death. In this context, eloquent and polite Shakespearean dialogue would seem vastly out of step with the world that the characters live in. So, this was a very clever choice on the part of the show’s writers -even if, ironically, it also makes the show seem a bit more “modern”. So, yes, keep any linguistic gimmickry in your stories, comics etc… fairly subtle and your audience will appreciate it. Hard tack and grog! This is the ninth comic in “Damania Requisitioned” – a new webcomic mini series featuring the characters from my long-running occasional “Damania” webcomic series. Links to many more comics featuring these characters can be found in the “2016” and “2017” segments of this page (there are also two in the “2015” segment, but they aren’t canonical). If you’re puzzled by this comic, then check out yesterday’s comic for more background. Well, I still seem to be in a “Duke Nukem 3D” kind of mood at the moment, so I thought that I’d check out a rather interesting set of levels called “Infestation In Time Revisited TC“. Although, at the time of writing, the ModDB page refers to an earlier version of “Infestation In Time”, the download page only includes the new version – which I will be reviewing. “Infestation In Time Revisited TC” contains 14 levels (spread over two episodes), some secret & multiplayer levels, new monsters, new weapons, new textures, 3D models, new gameplay mechanics, new music and new sounds. As the title suggests, it’s a total conversion – and yet it still looks very much like a “Duke Nukem” game, albeit with a hint of “Serious Sam”. The basic plot is that Duke is relaxing at home when *shock horror* the aliens decide to invade again. After battling them in Los Angeles, he travels to an EDF base in the Antarctic where he learns that the aliens are using a time machine of some kind…. Yes, Duke REALLY will get medieval on their asses. Literally! Although this mod tells a story, it mostly contains the kind of classic non-linear level design that you would expect from a real FPS game, even in the obligatory train level. In fact, the only truly linear level in the game is still surprisingly interesting for the simple reason that you spend literally all of it trying to outrun a series of fast-moving explosions. This level does what it says on the tin. Complete with “Harry Potter”-style dementors too 🙂 This is so cool 🙂 … Well, apart from the puzzle near the end of the level. Of course, the REAL code you need to use here is “DNCLIP” (or typing “noclip” in the eDuke32 command prompt). Likewise, level five of the first episode contains a switch puzzle… where the switches are spread out across a large level! Again, for the sake of my sanity, I had to use a cheat code or two. There’s fun difficulty and then there’s cheap difficulty. Cheats are useful for the latter. This isn’t actually the solution to the puzzle in question, but it was fun to do. As for the weapons, “Infestation In Time Revisited TC” includes some fairly cool ones. Some of the guns now even have 3D models too. It’s like the freezethrower… but with FIRE! During my limited experiments with the Build editor when I was a kid, I saw these things in the sprite files and I could never work out what they were supposed to be. But, now I know! The music is really cool, but this boss battle is actually easier than the episode one boss battle for the simple reason that there’s a circular arena and no extra monsters. If I had to give it a rating out of five, it would get a four at least. Walk the plank?! 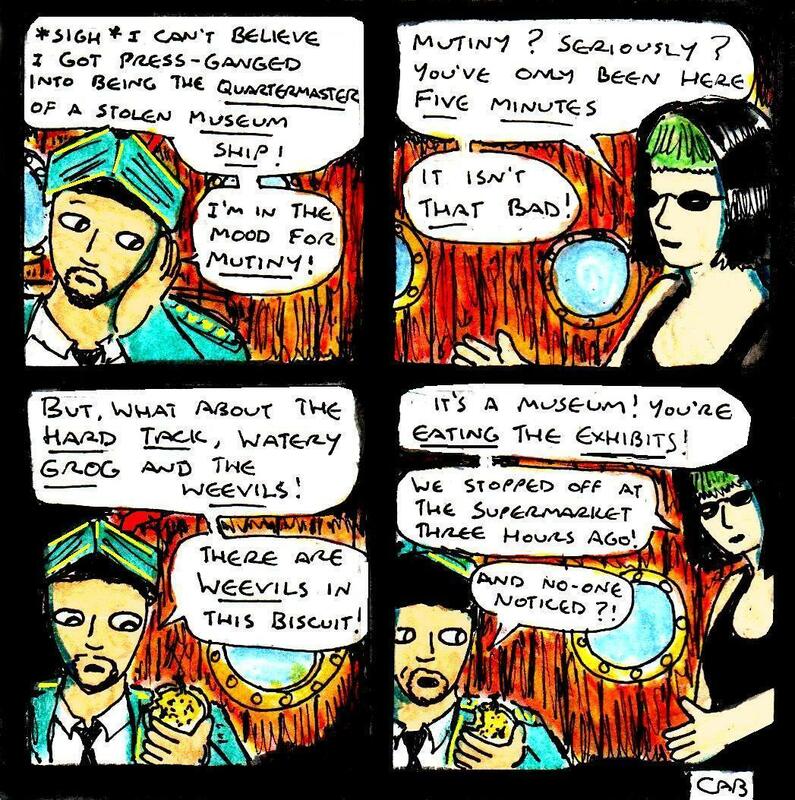 This is the eighth comic in “Damania Requisitioned” – a new webcomic mini series featuring the characters from my long-running occasional “Damania” webcomic series. Links to many more comics featuring these characters can be found in the “2016” and “2017” segments of this page (there are also two in the “2015” segment, but they aren’t canonical). Well, this comic required a lot more digital editing than I expected. It’s also a direct follow-on from yesterday’s comic (although hopefully, it still works as a stand-alone comic too).